Ellicott Development and Local Boys Restaurant Group discussed their plans to replace the Elmwood-Delavan Food Mart with a four-story mixed-use building this evening. The public workshop on the project was sponsored by the Elmwood Village Association and Delaware District Council Member Michael LoCurto. The Food Mart is located at the southeast corner of Elmwood and Delavan avenues. The ‘L’ shaped building will bring a dose of modern architecture to Elmwood. It will step down to three levels at the south end of the building along Elmwood and the east end of the building along Delavan. 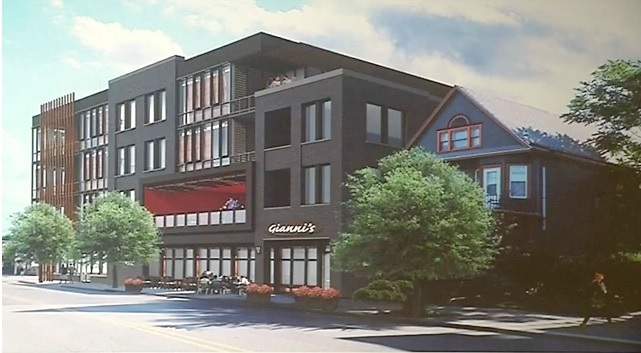 Plans call for a restaurant operated by Henry Gorino, retail space, and 21 apartments. An enclosed patio will be located on the second floor and some apartments will have deck or patio space. Parking will be located behind the building and accessed from Delavan Avenue. Kideney Architects is designing the project. The City Planning Board must sign-off on the plans and the development team will need to remediate the gas station site before starting construction. It will be the second gas station site to be redeveloped along Elmwood. Uniland Development removed the Valero at S. Elmwood and W. Chippewa for its 250 Delaware Avenue project. 766 Elmwood – Three-story infill building with retail space and 24 apartments. Benchmark Group. Underway. 1095-1121 Elmwood – Eight-story building combing retail, a boutique hotel with 125 rooms, enclosed parking for 160 cars, and 20 upper-floor condominiums. Chason Infinity. Planned.